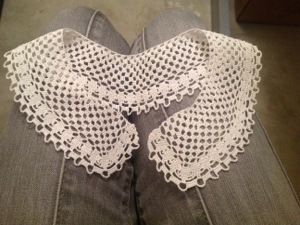 Last month, a young friend admired my crocheted lace collars, so I made one in her size. Here it is, all pressed and ready to go. Only she did ask for a rainbow colored collar…which I haven’t quite figured out how to pull off. Any ideas? I’ve finished another one. 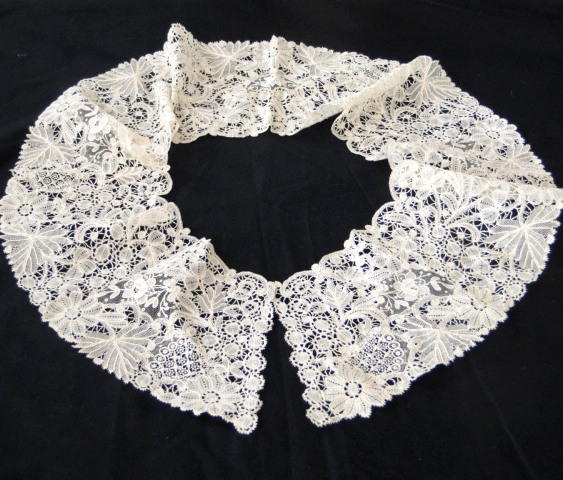 Also from Cornelia Mee’s 1846, this is the “Grecian Pattern” collar. This is definitely better looking overall than the last — though I think I might like the first collar a tiny bit better if it were executed sans edging. I love the way the front corners are worked on the diagonal. They look so “finished!” I redid this collar three times, and still didn’t get some of the details quite right. The directions aren’t terribly clear, and sometimes have to be tried out a few different ways. And the number of stitches NEVER comes out correctly. I begin to think it’s going to be trickier than I realized to translate these patterns for modern use. In the meantime, I am having a blast working through the originals, if only to see what they look like! I’m already well into the third collar pattern, imitating point lace. Each is a surprise, and I am in awe of the clever methods of forming the corners — which are, after all, the focal points of the collar once it’s sewn onto your dress. 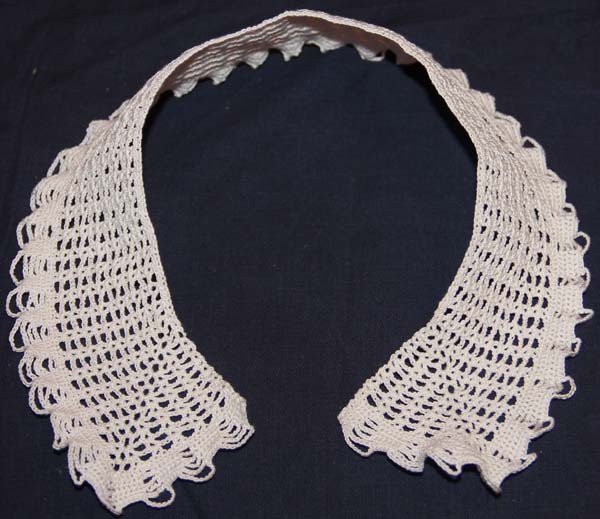 You may recall that I made this collar last week too — but didn’t trust the original pattern (from 1846) and ended up with a collar that fit my husband’s neck better than mine, and he’s quite a well-built fellow. Just between you and me, I don’t know that I’m overly fond of this collar. The last two rows (which account for the chain stitch borders) are a little silly, and even look kind of sloppy in places. Hopefully they will neaten up a bit when I block it. I may also make another version and leave the last rows off entirely. But I did have to see how it looked according to the pattern. It’s such fun to follow patterns without pictures — you never know how they’ll turn out. Perhaps it will look better over a dress too. Next up, Grecian Pattern Collar, also from 1846. My fascination with crocheted lace continues. While researching petticoat edging, I’ve come across so many collar patterns from the 1840s and 50s that I finally gave in. For my first attempt, I chose a pattern by crochet goddess Cornelia Mee in imitation of Brussels lace. I’m not quite sure in what way it is meant to resemble Brussels lace though. There were still two more rows to be added when this picture was taken. They didn’t do much to increase its affinity to any Brussels lace I’ve ever seen. This is real lace. I found the photograph (culled from Ebay) on Lace News. Brussels lace is a pillow lace, originally made in and around Brussels, naturally. 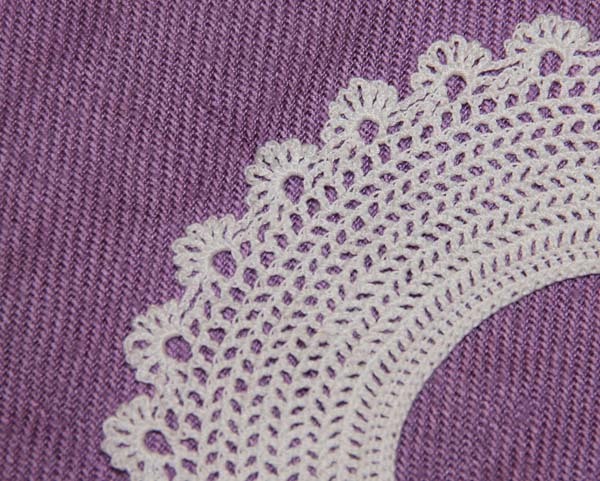 It’s frequently confused with other types of lace made in the same region, including Brussels point, a needle lace that is quite different. At least the experts say so. Back to my crocheted collar. It seemed awfully small when I began, so I added an extra 30 stitches to the starting chain, thinking that my gauge was off (always an iffy thing with an historic pattern) or that necks are simply bigger in 2011. But when I finished pressing it flat I was horrified to discover that my “swan-like” neck was just swimming inside the collar. So I immediately began a new iteration, sticking strictly to the pattern. I’m nearly done with the new version (it works up very quickly) and plan to give away the enormous one to someone who will wear it with modern blouses, which have wider necklines.